Did you sign up to participate in the State Action Team? Are you interested in learning more about the teams? 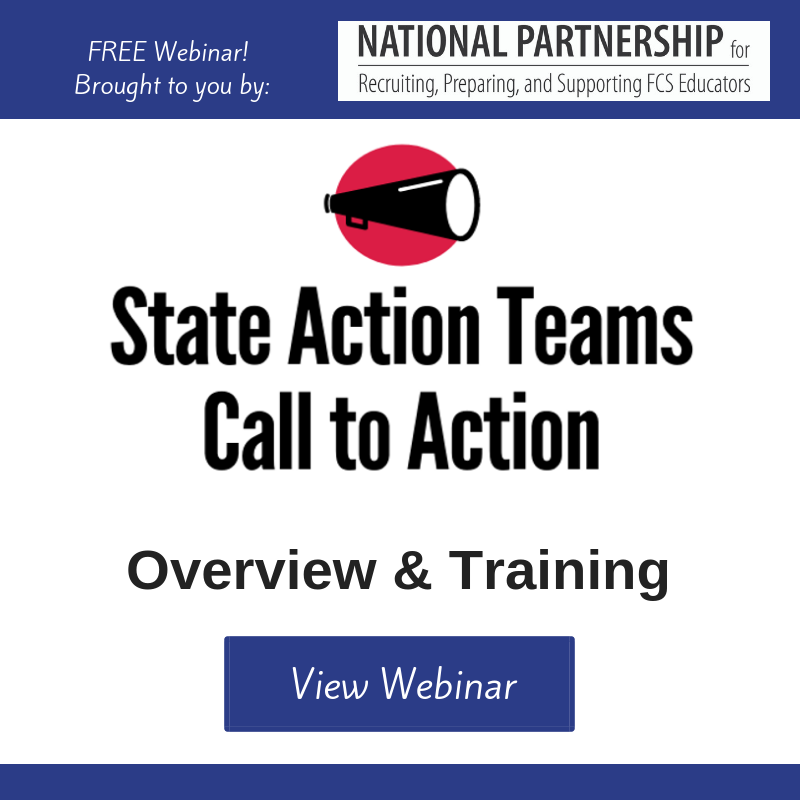 View this webinar to learn more about the role of the State Action Team in the "National Partnership to Recruit, Prepare, and Support FCS Educators." The training outlines the membership of the team and the expectations and timeline for their work. A newsletter will be distributed to all State Action Team members each month. Please check your spam/junk folders if you are not receiving the newsletter or contact us via email at adviser@fcclainc.org or sayyes@aafcs.org. State Action Teams are asked to collect and report data/details regarding the activities, events, meetings, and projects that were planned/facilitated to recruit, prepare, and support FCS Educators. Please submit a separate form for each project, event, or activity. How can you help recruit, prepare, and support Family and Consumer Sciences Educators? Let’s create a plan using the FCCLA Planning Process! Click here for Planning Guide! The National Partnership to recruit, prepare, and support Family and Consumer Sciences Educators has been awarded a USDA Grant and matching funds from AAFCS, FCCLA and SUNY Oneonta, for a total of $936, 572. In addition, 14 FCS professional organizations and partners have agreed to work together to meet the goals of the grant. The main objectives of this project are to create resources to support FCS educator recruitment, prepare future FCS educators, to promote FCS careers, and to share preparation resources on a national level. Thank you for all you do for the field of Family and Consumer Sciences!